As with most Aboriginal art, the subjects of paintings made in Warmun spring from the artists' relationship to the land. Warmun artists paint their country: the places to which they identify strongly. With their paintings they tell stories - about the ancestors who created the land, about the time before and after the colonization of their land, about bush food and medicine. They use a style that is distinctive from Aboriginal art made in other areas. Whereas in Central Australia the land is represented from an aerial perspective, in Warmun the land is painted in profile view, as seen by a person standing on the ground. "Dewari (devil) on the Midday Show", Adam Rish and Hector Jandany, 1997. In the mid-1970s when the Gija established Warmun community, they resumed their cultural activities to strengthen community life. The performance of ceremonies played an important role to reconnect to the land and the spiritual world. New ceremonies were found as well. They were handed over to some ritual people in special dreams. One of the new ceremonies was the Gurirr Gurirr song cycle, which was dreamt by Rover Thomas. It expresses the journey his classificatory mother made after she died in a car accident. It focuses on places known and important to Gija people. The songs, which are short and repetitive, call forth spiritual, historical and personal information about the places mentioned and personalities encountered. 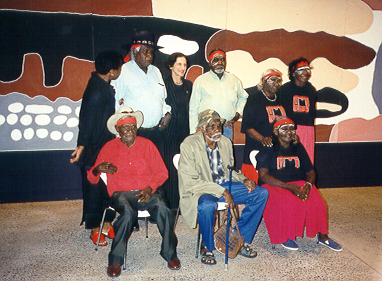 The ceremony was at first performed in the community itself and later also outside it, such as in Maningrida and Perth. Paintings played an important role in the performance: they were carried by the dancers and depicted the places that were sung about. At first there was only one painting, on cardboard; in later performances more paintings were involved. The picture above is a painting made by Adam Rish and Hector Jandany. Dewari guides the spirit of the dead woman as she travels. In this painting the Dewari guides us (the dead?) on the midday show. Another incentive to produce paintings was the establishment of a local school in Warmun, in 1978. Community members had lobbied for their own school since children started losing their language and culture at the schools in Wyndham and Kununurra that they had to attend. In the new community school elders were actively involved in teaching. They used paintings to accompany their story telling in the local language. Increasingly elders began to paint and passed on the technique to others. All these works were displayed in classrooms and stored away until an arts representative from Perth 'discovered' them, attempted to purchase them and stimulated the Warmun painters to paint for the commercial market. The paintings then got a new destination in museums and galleries. Their aesthetics were much praised in the art world, where Aboriginal art had just started to become acknowledged for its visual invention.